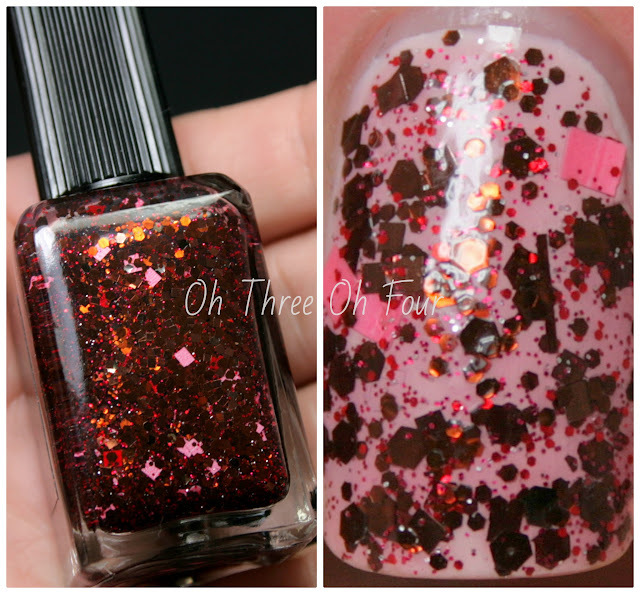 Chocolove Cherry contains brown, red and opaque bubblegum pink glitter in various shapes all in a clear base. All nails are 2 coats of Chocolove Cherry over 2 coats of Orly Decades Of Dysfunction and a top coat of Seche Vite. While I wasn't able to get out any of the larger red glitters, I still love the combination I did get. My bottle has a slight pink/red tint to the base and I'm 100% ok with that because it made Decades Of Dysfunction look amazing. Lynn's polishes always make me second guess colors I don't normally like, brown and green, and have me wanting more of them! I'm very happy I didn't pass up this color at first glance and now am eager to buy more brown polishes! S.W.A.K. is described as assorted red, white, pink with a hint of gold in a base spiked with hot pink shimmer. Also contains scattered pink, white, red and gold hearts. I started with 2 coats of Sephora Pantone Parachute Purple and added 2 coats of S.W.A.K. and a top coat of Seche Vite. The Key To Her Heart has a coral base and various shapes and sizes of pink, coral, gold and white glitters. All nails are 2 coats of The Key to Her Heart over 2 coats of Essence Grey-T Be Here and a top coat of Seche Vite. Find Lynnderella polishes on eBay here. You can follow Lynnderella fan pages on Facebook here, Tumblr here, Twitter here and Instagram here.